Add ingredients to a blender and puree until smooth. Serve the smooth mixture immediately or transfer to the freezer until ready to serve; remove about 15 minutes before service to allow the sorbet to soften a bit. *I used a Cuisinart and was enjoying fresh sorbet within about 30 minutes. If you don't have an ice cream maker, or don't have plans to purchase one, consider shopping the pears into small chunks, tossing them with the lemon juice, and then freezing; once frozen, the pears and lemon juice can be pureed in a food processor or heavy-duty blender. You can use any frozen fruit for a quick sorbet. Just toss it in the blender or processor with a little water (to help it puree) and puree until smooth. Easy! 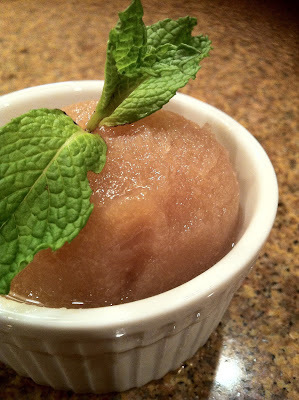 This sorbet was so easy and the perfect followup to a big meal. If you have ripe, in-season fruit you shouldn't need any other sweeteners in this dessert. Made this and loved it! I was feeling bad about abandoning our awesome Cuisinart ice cream maker once we went Paleo, but completely forgot about sorbet. Thanks! No problem! And, not that I want your ice cream maker to go unused, but you can keep a bag of frozen fruit in your freezer and just use your food processor, for a quick fix! :) I did this with a mix of peaches and raspberries, recently...yum! You could also try Pineapple-Mango, with a little Coconut Milk...just thought of that! Sort of like a pina colada.